All carts saved to your database can be managed. 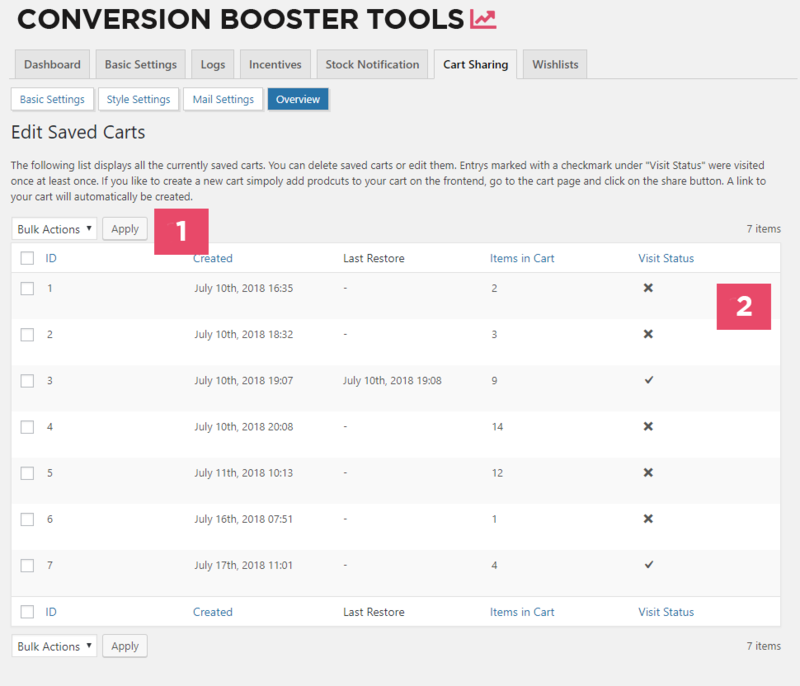 You can add products to existing carts, delete products, see how often a cart was restored or delete entire carts manually. It is not possible to create new carts directly in the admin settings. If you want to create a new cart simply go to the frontend of your site, add all the desired items to your cart and click on the share button. Your current cart will then be saved to the database and will be available in this overview. Just with any other WordPress table its possible to perform bulk actions. You can currently batch delete selected carts. The carts table displays the currently saved carts. In this overview you see when a cart was created, when it was last restored, how many items are in the cart and wheter the cart was restored at least once or not. The cart editor gives you basic information about the current cart. This section visualizes restores that happend in the last couple of days. Displays a list of products that are currently saved in this cart. You can delete products from a cart using the red „X“ button. If you changed the amount of a product you can simply click on the green checkmark box to save these changes. You can use this little form to add new products to the shopping cart. Simply click on the „Select a Product“ field and type in the name of the product you want to add. 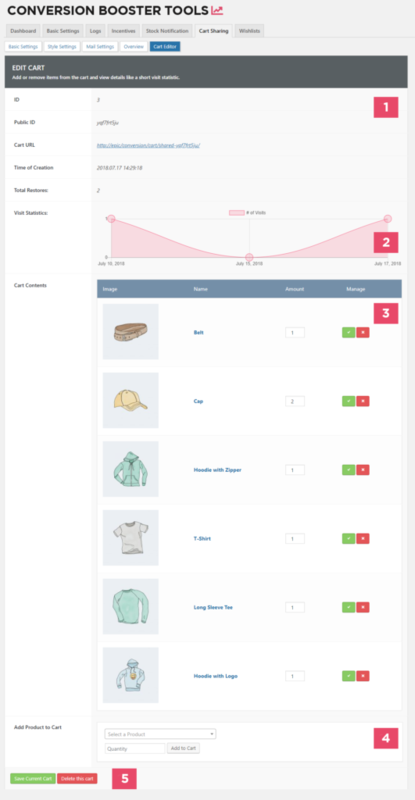 You can also select a variable product as shown in the picture bellow. To add the product to the cart simply click on the „Add to Cart“ button. You can either save the current cart or delete it.